Baby it is still hot outside! We are burning up here in Kansas. It is HOT! I can’t bear to turn on the oven and I am craving cool things! I gave this watermelon salad a try and I am glad I did. As usual, Paula Deen rocks! This is a watermelon salad that is simply brilliant. It looks quite appetizing too, and should be a treat at any mealtime. It is perfect for summer, thanks to its refreshing appeal and its rich taste. Family could not get enough of it, did not have to be reminded not to forget the salad as is usually the case. Thanks for this. Oh my! 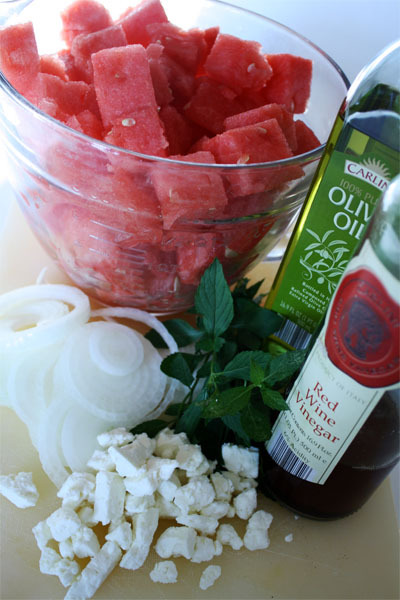 This watermelon salad was delicious – and so easy to make! Will have to try this for my family. Thanks so much, Cindy! I prefer healthy food! And I’ll definitely try this watermelon salad. My family would love it! Thanks, Cindy for sharing! These are so Instagrammable and adorable! This watermelon salad looked soooo good, I had to try and make them. I used your suggestion and used 1/8 cup red wine vinegar. Thx for sharing Cindy! I'm in Australia where we have long hot summers , my mum used to make a salad with just the Watermelon , onion and mint and it is yummy. I adore watermelon. Just so refreshing for summer! Made the salad this weekend and it's a hit! Husband and I both devoured it. I doubled the amount of feta cheese it calls for, though. Cheese lovers are we! This looks very yummy. My daughter has really been wanting fruit salad, this will be an interesting twist. Love the pic as well. Maybe it's my aversion of using fruit in salads...... Not sure? YUM. You are making me hungry girl. My sis makes this salad all the time. It sounds gross, but is really delish! :) I love Paula Deen. She's so adorable. My Mom is her biggest fan. I agree. I live in KS and it is too hot! I got your crockpot baked potatoes going for dinner tonight, so no oven needed! This recipe looks good! Thanks for sharing! I love watermelon, this look delicious! On a side note, I'm a faithful reader and can't believe that I had NO idea that you are in Kansas! I'm in Olathe...it's so freakin HOT! My son just bought me a watermelon. I might have to try this. Ooohh....Going to an outdoor get together on Sunday and I'll betaking this with me! Yummy! 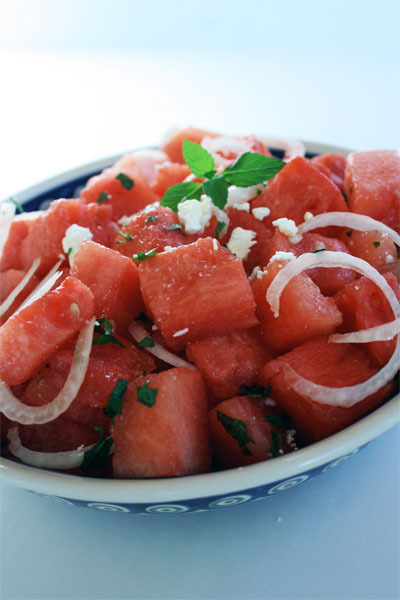 I just recently had a watermelon salad similar to this at a family get together and it was delicious! Interesting combination! It looks so good and I've never had anything like this before!